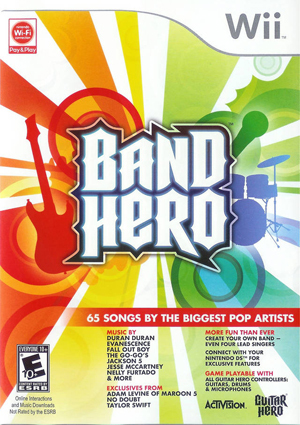 Band Hero is a spinoff video game as part of the Guitar Hero series of music video games, released by Activision on November 3, 2009, for the Wii. The game is structurally similar to Guitar Hero 5, and supports full band play (lead and bass guitar, drums, and vocals) including the drop-in/drop-out and in-song instrument and difficulty change menus, and additional multiplayer modes as Guitar Hero 5. The console versions use instrument-shaped game controllers. Like previous games, virtual avatars of Taylor Swift, Adam Levine, and the band No Doubt are presented in the game. A hang occurs after completing a song making progression impossible. Refer issue 10660. The graph below charts the compatibility with Band Hero since Dolphin's 2.0 release, listing revisions only where a compatibility change occurred. This page was last edited on 21 August 2018, at 06:55.